What Really Happened to NASA’s Mars Rover, Opportunity? Opportunity was about to make the Discovery of the Century! NASA’s Opportunity rover explored the surface of the Red Planet, Mars, for almost 15 years when Opportunity suddenly stopped communicating with Earth. And now we know why! 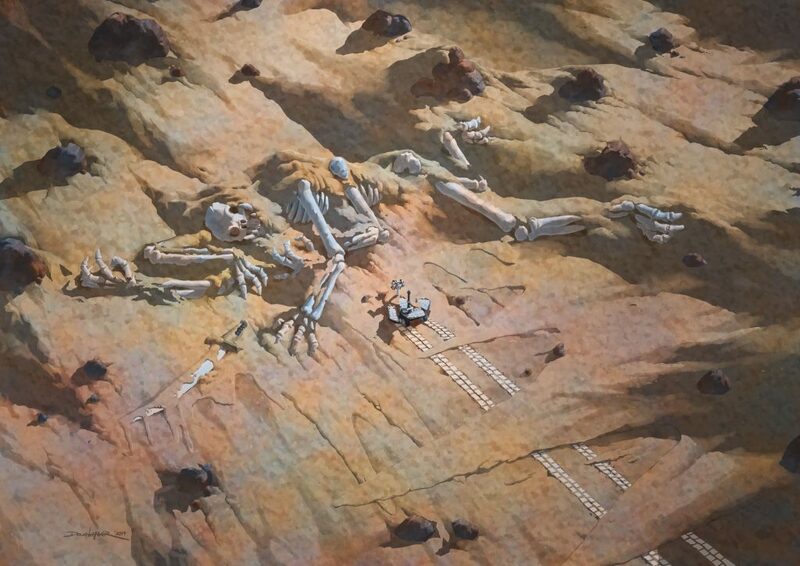 Opportunity had come upon the skeleton of a dead Thark, clearly validating Edgar Rice Burroughs’ 1912 claim of life on Mars. But the excitement was just too much for Opportunity, and before it could transmit this incredible discovery to Earth, its machinery stopped – creating the universe’s first ever motor heart attack. The scene is poignantly portrayed in this excellent illustration by Doug Lefler (www.douglefler.com) who is currently Head of Story for The Third Floor – the world’s largest visualization company for the entertainment industry. Thank you, Doug, for explaining how too much excitement and exhilaration caused the sad demise of Opportunity. Happy April Fool’s Day from Edgar Rice Burroughs, Inc.!